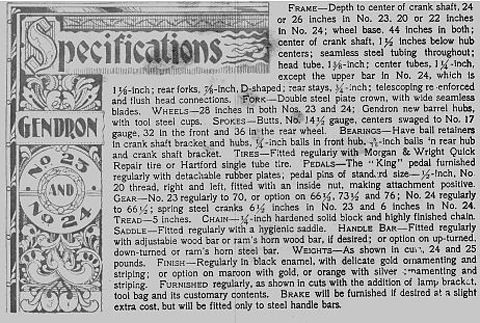 All Gendron products have an important pedigree, as founder Peter Gendron was instrumental in the development of the metal bicycle wheel, which he patented in 1874 – the advertisement above shows ‘wooden wheel goods knocked out’. The company’s brand name ‘Pioneer’, used on its children’s tricycles and riding toys, was therefore apt. Peter (Pierre) Gendron was French-Canadian, from Quebec. 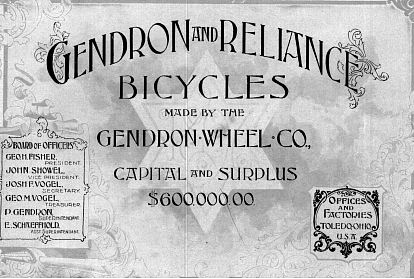 In 1895, after his American company, based in Toledo, Ohio, had become well-established and the ‘bicycle boom’ was at its peak, Gendron moved into the Canadian market, establishing the Gendron Mfg. Co of Toronto, Canada. His was one of the group of companies that merged to become Canada Cycle & Motor Co. Ltd, more commonly known as CCM. With the sale of its cycle works to CCM in 1899, Gendron turned his attention to the motor car and, by 1920, Gendron had become the world’s largest manufacturer of children’s pedal cars, built to imitate the full-size automobiles of the day. Using the ‘Pioneer’ name, the Gendron brand became synonymous with high quality pedal cars featuring cylindrical rear gas tanks, tool boxes, imitation cranks and nickel trim. As well as being a major player in the early years of the Canadian cycle industry, Gendron exported bicycles to France at a time when the French cycle market was yet to become mainstream. No doubt his French-Canadain heritage gave him an edge over other American cycle companies who were just as keen to export their products. In the late 1890s, his bicycles were sold by agents in France, many of whom, having established a market, became cycle manufacturers themselves. This fabulous machine was on display at the Gendron Museum in Archbold for many years, until the museum sold off its contents in an auction, to be purchased by my friend Mark in Illinois. (It still displays its auction label). It’s in wonderul unrestored original condition, with nickel fork tips, wooden handlebar, full accessory set, and Fauber crankset. Some cycle companies fitted Fauber cranksets to gain an edge over their competitors. The Fauber ‘Star Sprocket’ fitted to this Gendron came onto the market in 1898. Being a well-advertised upmarket component, Fauber cranksets have achieved a mythical status among vintage collectors in the 21st century. Another interesting component is the Morrow coaster brake: this is the 1901 pattern with a non-articulated brake arm. (In 1902, the brake arm was articulated). Until 1904, the arm fitted to the chainstay on the right (chain) side, rather than the left. The first coaster brakes fitted by English cycle companies were actually this style of Morrow, which preceded the Eadie Coaster.